Yesterday, Discovery News published a review of CrossFit. The host, Trace Dominguez, made many false and misleading claims. What follows is a transcript of the show, with Russ Greene’s notes inserted. “How do you know someone does CrossFit? Because they’ll tell you. But is it worth all the love? Science says it’s not even close. 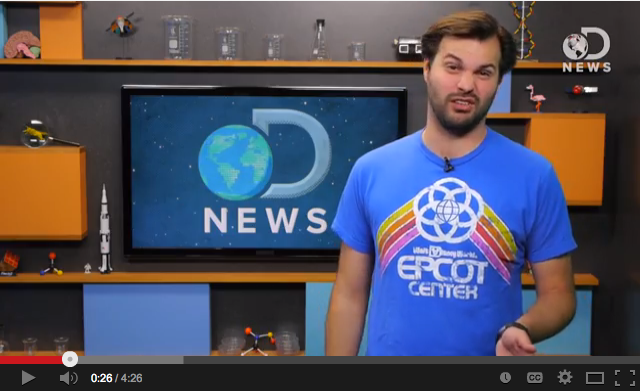 Hey fitness fanatics, Trace here for DNews. CrossFit is a growing trend because enthusiasts say it makes them look hot. 60% of CrossFitters are women and there are 6,000 CrossFit gyms, they call them ‘boxes’ across the US. Some CrossFit enthusiasts say that the benefit of the exercise regimen are fat loss and muscle growth, but the science behind this exercise program is, well, shady. – All the facts here are false. There is no evidence that “60% of CrossFitters are women.” There are nearly 10,000 CrossFit gyms, not 6,000. – The “shady” science he mentions showed that CrossFit was effective at increasing work capacity and VO2Max, and decreasing body fat percentage. The US Army studied CrossFit and was like “meh”. To be sure, the OSU study alleged that 16% of the subjects failed to show up to final testing “citing overuse or injury.” But, this claim is baseless and fraudulent. More on that later. And now CrossFit has come under fire not because CrossFit is bad but because there’s a culture of going too high, too fast. CrossFit combines cardio, jumps, lifts, pulls, gymnastics, and repetition with an emphasis on speed. It pushes newbies to heavier lifts quickly relative to traditional programs, which gets results quickly but isn’t based on lifestyle changes, long-term health, or training goals, and instead focuses on the workout goals. It’s more about the workout culture, lifting more, going faster, and being more awesome. It’s like brozercise! – To the extent that he is claiming that CrossFit pushes newbies beyond their ability levels, this is completely false, and unsupported. CrossFit teaches to develop mechanics, then consistency, and only then add intensity. It also instructs all trainers to scale workouts to levels their clients can manage. Part of the reason that there’s no emphasis on health goals or training programs is because CrossFit coaches aren’t actually really trained. Certification takes two days and costs a thousand dollars. Anyone can do it, and it’s a great way to cash in on a new craze. Compare that to a PhD in sports science or kinesiology and the culture suffers for that dolla dolla bills y’all. – It is fundamentally misleading to compare the CrossFit L1 to PhD programs. No personal training certificate requires a PhD. Like CrossFit, the ACSM and NSCA offer personal training and group exercise certificates that require written tests, but CrossFit goes one step further with in-person instruction on teaching movements. – If he wants to compare CrossFit’s L1, he should compare it to other personal training certificates. Almost no trainers anywhere have PhD’s in a relevant field, and most PhD’s do not train people as a profession. Science-wise, CrossFit is too new to really measure accurately. A study in Plosone found lifting low weights with many reps improves fitness and strength better than heavy weights. But CrossFit exercise calls for 10, 30, 50, repetitive lifts with a high weight. Why? I don’t know. – CrossFit trains athletes to lift weights for low reps, moderate reps, and high reps? Why? Because CrossFit trains people for the unpredictable physical demands of life, and sandbags, rocks, suitcases, etc. rarely must be lifted just once. Olympians who are peak human specimens stick to gradual increases and low reps because, ya know, science. Olympic trainers are focusing on conditioning, strength, and health. Conversely, the culture of CrossFit seems to only love it harder, faster, with more power. So the culture seems to be the problem, not the exercise. – This presents a false dichotomy between focusing on “conditioning, strength, and health” and pursuing “harder, faster, with more power.” The fact is that conditioning, strength and health can only be improved, and measured (!) through improvement in weights lifted, time for completion, etc. – Citing what one CrossFitter said in 2005 is not representative of the CrossFit community as a whole, or CrossFit policy, at all. What is Trace’s source for his allegation’s about CrossFit’s culture? What CrossFit gym has he attended, of the 10,000 affiliates? But doing 50 repetitive, rapid exercises lifting heavy weights, that’s not good for the human muscle. During exercise muscles have micro traumas, which then heal during rests periods building more muscle. Because of a lack of trained exercise scientists CrossFit culture values that pain above the safe training and thus the muscle tissues eventually fail, causing rhabdo, which is a cute nickname CrossFitters have for rhabdomyolysis. Rhabdomyolysis happens when the muscle tissue bursts due to overexertion, literally, the cell pops, releasing the contents of it into the blood stream, leading to hospitalization and possibly kidney failure. It can happen naturally outside of a CrossFit gym due to severe dehydration or heavy use of heroin, or cocaine, or extreme heat, or seizures, or destructive crushing trauma, like in a car crash, but CrossFit style exercises increase the likelyhood of rhabdomyolysis over the general population by 300%-400%. – Where is the source for the claim that CrossFit increases the risk of rhabdo by 300-400%? – He fails to mention that a wide range of exercise has caused rhabdomyolysis. This gives the impression that it is caused by extreme trauma or only CrossFit exercise. When Ohio State attempted a single, 54 person study, 16% dropped out due to injury. Good exercise and fitness requires months or years of slow, increasing difficulty, a lifestyle-changing diet, and proper supervision. – The study’s own data coordinator, and all of the subjects interviewed, said that the researchers made up the alleged “overuse or injury” data:http://journal.crossfit.com/2013/05/acsm.tpl. In contrast, Hak et. al found that CrossFit survey respondents reported an injury rate (3.1 per 1000 hours of training) that was just over half what has been found for “general fitness training.” In other words, they found that CrossFit had a lower injury rate than traditional fitness training, not to mention that running, triathlons, and ball sports. The exercises in CrossFit decrease body fat, they increase muscle mass, and they help with oxygen usage by the body says a study from the NIH. There’s not a major league team, military organization, or Olympic team that officially support or practice CrossFit. – False. The U.S. Military is CrossFit’s single largest client for CrossFit seminars. CrossFit has conducted hundreds of seminars for U.S. military units. The Marine Corps and Army (linked above) have both published materials in support of CrossFit. And the National Strength and Conditioning Association has never given it accreditation. – The NSCA does not grant accreditation to its competitors, and is itself accredited by an external body. The NSCA’s courses are accredited by the “National Commission for Certifying Agencies.” In turn, CrossFit is accredited by the American National Standards Institute. This guy needs to be slapped…also, whoever allowed them to go through with this video/script needs to be slapped. Very unprofessional. Great job Russell!